In progress: UEM Land is currently developing Nusajaya, one of the five flagship zones of Iskandar Malaysia in Johor. KUALA LUMPUR: Fresh from the consolidation of its operation after the purchase of Sunrise Bhd, the enlarged UEM Land Holdings Bhd now has a complete set of skills and expertise to scour for opportunities in new growth markets, both locally and overseas. “This is a match made in heaven and the coming together of the expertise of both UEM Land as a township developer and Sunrise's acclaimed reputation in high-rise integrated developments has opened up vast opportunities for us to tap going forward,” Wan Abdullah told StarBiz. “We are talking to a number of potential partners and will be sending our teams to India and Vietnam to explore the opportunities there,” Wan Abdullah said. He said as Myanmar was opening up its door to foreign investments, the company was studying how it could partake in the development process of that country. Locally, Wan Abdullah is confident that having Sunrise under its belt augurs well for UEM Land to bid for landbank and redevelopment projects from the Federal Government and various state authorities. “Two years ago when we approached these authorities for development opportunities, they have their reservation about what we can offer as a township developer. Today, given Sunrise's expertise in high-rise integrated developments and strong branding, UEM Land is enjoying a stronger profile, skill set and competitive advantage,” he added. In a research note, Maybank Kim Eng said UEM Land was likely to win more government land deals, such as the Rubber Research Institute of Malaysia land in Sungai Buloh and the former Pudu jail development project in Jalan Hang Tuah. 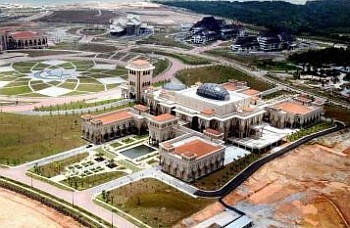 UEM Land is the property arm of UEM Group, which in turn, is wholly owned by Khazanah Nasional Bhd. The company became the biggest property counter on Bursa Malaysia by market capitalisation after buying over Sunrise. It now has a market capitalisation of close to RM10bil based on 4.324 billion shares issued and closing share price of RM2.31 yesterday. Wan Abdullah said UEM Land aimed to chalk up another record year of sales of RM3bil this year from RM2.2bil recorded last year. The company has projects worth RM34bil to be launched over the next couple of years. It is currently developing Nusajaya, one of the five flagship zones of Iskandar Malaysia in Johor, and also has projects in Bangi, Cyberjaya, Kajang and Mont' Kiara. Another exciting project to look out for will be the RM1.3bil Angkasa Raya project, which is Sunrise's new landmark project in the Kuala Lumpur city centre. .
For the year ended Dec 31, 2010, UEM Land posted a net profit of RM194.5mil on revenue of RM469.7mil. Analysts expect the enlarged company to turn in a strong double-digit growth in its financial results in FY2011, mainly due to the consolidation of Sunrise's earnings. The company will be releasing its final-quarter results for FY2011 on Feb 28.